The holiday season is upon us and for many families, that means road trips to see relatives both near and far. 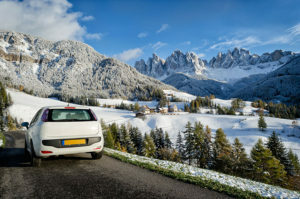 Whether you’re traveling 45 minutes across the Valley, or driving five hours or more home to family, you’ll need to be sure you’ve gotten your car ready for the trip, as well as ready for any type of weather you might face. Start off with cleaning your car inside and out. First, this makes the trip more comfortable for everyone, and second, it gives you a chance to inspect the interior and exterior of your car to see what you have packed for emergencies, what you need to add, and if there is any damage that needs repaired prior to your trip. When you’ve cleaned out the trunk of your car or the back of your SUV, check your emergency preparedness. We suggest you carry a First Aid kit, a plastic funnel – in case you need to add fluids to your vehicle at some point, a spare gas can, a small bucket or other container for carrying water, blankets, flashlight (check the batteries and bring extra of the right size! ), charging cords for your phones, as well as a portable charger, drinking water, ice scraper, a tool box with screwdrivers of different sizes and types, duct tape, bungee cord, and rope. Also, check your jack and be sure all parts for changing a tire are there – lug wrench, jack, turn for jack, etc. All of these items can help to keep you safe in an emergency. Now, getting the vehicle itself ready means checking the tires for wear and correct air pressure. (This includes rechecking the spare to be sure it’s inflated and the tread is in good shape) Next, check all fluid levels such as oil, transmission, brake, coolant and windshield cleaner. Top off any that are low. If it’s been a while since your last oil change, it is better to go ahead and change the oil and filter before you travel. Check your windshield wipers to be sure they are in good shape – heat in Arizona can destroy the rubber after just a summer of our extreme temperatures. Check your high and low-beam lights, running lights, fog lights, hazard lights and brake lights. If you have spare bulbs, pack them in the glove compartment with your owner’s manual. The manual could come in handy for you or for any mechanic who needs to look at your vehicle if you have an issue while traveling. Make sure you have your insurance card and your insurer’s phone number, any roadside assistance numbers if your insurance offer it, and your AAA card, if you are a member. To help you prepare for a road trip, Desert Car Care McQueen is currently offering either a $50 (semi synthetic oil) or $70 (full synthetic oil) Road Trip Special. We’ll inspect your vehicle from top to bottom, and make sure it is ready for the road.